Mimi's fig and pistachio cake. Photo by Oddur Thorisson. 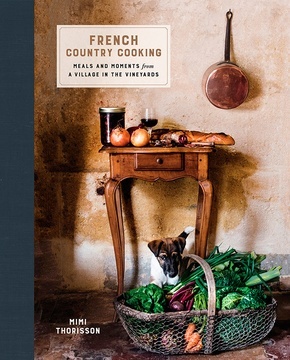 Inspired by her life in Médoc, France, cookbook author Mimi Thorisson's new book, , explores the meals and moments she enjoys the most in her small village. One such ritual, l'heure du goûter, takes place at the end of a school day, when parents and children make a pilgrimage to the local boulangerie for a treat. 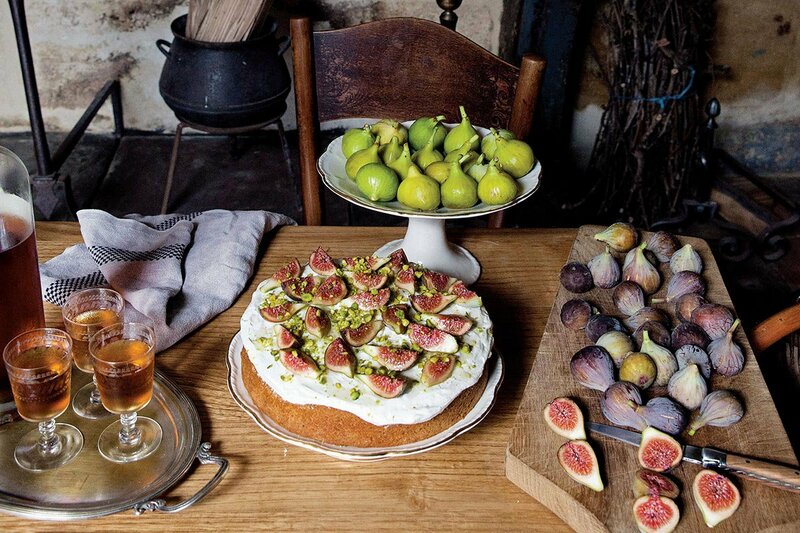 On weekends, the ritual is enjoyed at home with freshly baked goods, like a slice of fig and pistachio cake. MÉDOC, France – I'm very fond of iconic things. And France has such a wealth of them — many of which revolve around food. The plump, mustachioed gourmand at the brasserie enjoying frog legs and a bottle of wine. The monsieur sipping a ballon de rouge before noon at the corner cafe. The "mothers" of Lyon, cooking delicious but simple food in their own restaurants. My favorite images, though, just might be the ones with children — children and pastry, to be specific. The little girl in a red coat, strolling through the park on her way home from school, carrying her schoolbag in one hand, a crêpe with salted-butter caramel in the other, perhaps stopping along the way for a quick ride on the carousel. In France we have, like everybody else, breakfast, lunch, and dinner. But we also have something else, something sacred: l'heure du goûter, a special hour that involves kids and cakes and usually comes right after school. The reward for a long day in the classroom is stopping by the local boulangerie, waiting in line with the other kids and their parents, scanning the treats displayed in the glass case, and picking out a favorite. On weekends this sacred hour often takes on elevated status; instead of going to the boulangerie, all the action is in the family kitchen where someone (probably mom, but more recently also dad) will be baking something simple but always delicious and special. The kids often get to participate in the baking. For them, messing around in the kitchen is half the fun. These recipes will be some of the first ones they learn to make on their own, by heart, and will someday teach to their children. What follows are moments of true family bliss, children seated around the kitchen table, savoring every bite of their afternoon treats, with a glass of milk or a cup of deep, dark hot chocolate with a dollop of whipped cream. And by children, of course, I mean children of all ages. This is my garden party cake, the one I'd make if the Queen of England ever came to visit. She'd have to come during fig season, of course, and we'd have tea and a slice each of this moist cake. We would sit there and discuss our dogs and she would comment that fox terriers have a terrible reputation and that, in her opinion, corgis are a much more interesting breed. She's the Queen so I wouldn't argue with that; afterwards we'd just stick to the weather and have more cake. 2. In a food processor, combine the pistachios, butter, 1/2 cup of the sugar, and the vanilla and pulse for a minute or until you get a smooth paste. Add the egg yolks, one by one, and pulse until well combined. Transfer the pistachio mixture to a large bowl. 3. Using an electric mixer, whip the egg whites, and when the mixture starts to foam, add the salt. Continue to whip on high speed, gradually adding the remaining 1/4 cup sugar, until the whites hold stiff peaks. Fold the egg whites into the pistachio mixture. 4. Grease an 8-inch cake pan with butter. Pour the batter into the pan and bake until a knife inserted in the center comes out clean, about 25 minutes. Let cool in the pan for 10 minutes before unmolding onto a wire rack to cool completely. 5. Using an electric mixer, whip together the heavy cream, mascarpone, honey, and orange flower water until the cream holds stiff peaks, about 3 minutes. 6. Spread the cream on top of the cooled cake and arrange the quartered figs on top. Crush some pistachios and scatter all over. Finish with a drizzle of honey to gloss it up. Serve immediately. Buy , by Mimi Thorrison. Reprinted with permission from French Country Cooking. Copyright © 2016 by Marie-France Thorisson. Photographs copyright © 2016 by Oddur Thorisson. Published by Clarkson Potter/Publishers, an imprint of Penguin Random House, LLC. Mimi is a blogger and the author of and the just-released . You can find more of her recipes at or follow her on . She travels for the food.